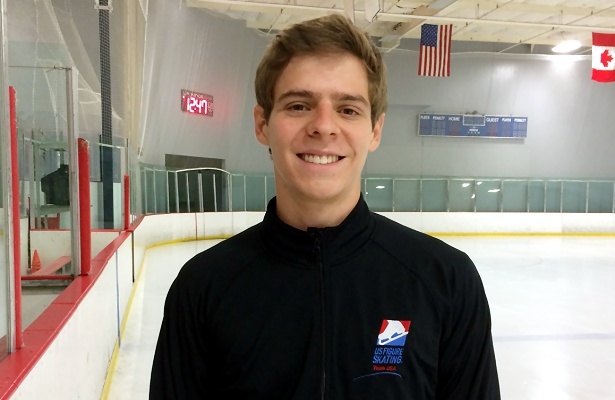 USA’s Richard Dornbush get’s ready for practice in Riverside, Calif.
USA’s Richard Dornbush recently competed at Lombardia Trophy in Italy, where he finished in first place, earning a new personal best in both the long program and total score along the way. All of Dornbush’s practices went well, as did both of his warm-ups, and he put out two good programs, landing all of his triple jumps. Although the former US silver medalist didn’t land the quad, he earned high levels and positive grades of execution (GOE) for his spins and footwork. Although a veteran skater, Dornbush was reminded at Lombardia that “being confident” and “staying in the moment” are keys to a successful skate. His main goal for the rest of the season is to treat the quad like any other jump, just as he does in practice. “I think I just need to get over this mental hurdle. It’s all just rotations in the air after all, so what’s one extra turn?” he laughed. The 23-year-old, who is coached by Tammy Gambill, is now preparing for his two Grand Prix (GP) events—Cup of China and Trophee Eric Bombard. Currently, there are no planned changes in his programs for the GPs other than a bit of tweaking in the choreography. The skater from Corona, Calif., is keeping his short program from last year to Mancini’s “The Sons of Italy”, while is new long program is to “Yellow” and “Viva la Vida” by Coldplay. Both routines were choreographed by Mark Pillay. One of the main reasons the skater stayed with his short, is that he felt he has not performed it to it’s full potential on the international level. Lyrics turned out to be a big part of the reason why Dornbush chose the music from Coldplay, however, Pillay introduced the idea to the skater. Like many other athletes, Dornbush is currently balancing school with training. He recently transferred from Riverside City College to the University of California, San Diego in order to finish up his undergraduate degree in Physics. The 2012 Finlandia silver medalist took a year off school to decide on a major and train during the Olympic season. In the past, he was awarded the Memorial Fund from the United States Figure Skating, which aided in the heavy cost of both skating and university level education. “Obviously, it turned out that taking a year off would not have have mattered so much, but at the same time, it gave me a lot of perspective and taught me a lot about what kind of athlete and skater I wanted to be,” said Dornbush. Dornbush’s main goal for this season is to establish himself as one of the top skaters on the international scene and the top skater in the US. The 2010 ISU Junior Grand Prix Final champion spent some time self-reflecting to decide what he really wanted out of the sport after that. This is what Dornbush wants to change for himself. In order to get there, Dornbush is focusing on becoming a more consistent skater.